Vicks Peak in Socorro County’s San Mateo Mountains was named after Victorio, “a Mimbreño Apache leader whose territory included much of the south and southwest New Mexico.” Famous for defying relocation orders in 1879 and leading his warriors “on a two-year reign of terror before he was killed,” Victorio is at least as highly regarded as Geronimo or Cochise among Apaches. The greatest leader of the Mimbreño Apaches (often called Gila or Warm Springs Apaches) was the indomitable Victorio. 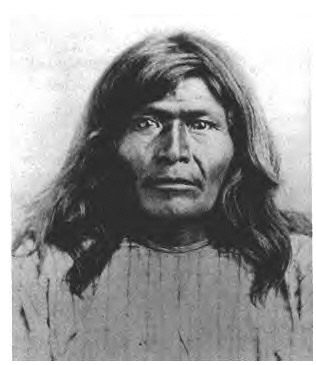 It is believed that he was born about 1825 and soon became a respected warrior among his people, and all other Chiricahuas. He was in many skirmishes with Mexicans, and later, Americans, but about 1870 he accepted land set aside for him at Cañada Alamosa, New Mexico. Then, in 1872 he moved to Tularosa (today’s Aragon), New Mexico. Next, he moved to a reservation at Warm Springs (Ojo Caliente), New Mexico. The U.S. government, however, was not happy with Apaches settled on various locations in the Southwest. It was believed that they should be settled in only one place, so that they could watched more carefully. That place was San Carlos, Arizona. Therefore, in the spring of 1877 John Clum, agent at San Carlos, went to Warm Springs to bring the Mimbreños back. However, 300 Mimbreños refused to go. They broke out under the leadership of Victorio and Loco. Nevertheless, for a short time they surrendered at Fort Wingate, New Mexico. Still unsatisfied with their lot, they broke out again from Mescalero, New Mexico on 21 August 1877. Victorio went with his people this time to the Black Range, west of the Rio Grande. Traveling with him was the leader of the Nednhi band of Chiricahuas, Juh. They were pursued by Major Albert P. Morrow. Eventually they were driven deep into the Mexican state of Chihuahua. In October 1880 Victorio and his people were cornered at Tres Castillos by Lieutenant Colonel Joaquín Terrazas, cousin of Chihuahua governor Luís Terrazas. Victorio was killed there, along with almost all of the Mimbreños. Descendants of Victorio, however, still live in Oklahoma and on the Mescalero Apache Reservation in New Mexico. It is hard to describe just how great a warrior Victorio really was. I have not gone into detail about his method of fighting, but most historians consider him among the greatest guerrilla warriors the North American continent has ever seen. Against incredible odds he was able to successfully remain independent of American and Mexican control to the end of his life. Thrapp, Dan L. Victorio and the Mimbres Apaches. Norman: Univ. of Oklahoma Press, 1974.